Forget about sleep-parade starts at 3 a.m. The Junkanoo Parade requires endurance. Starting at 3 a.m. in the morning on both Boxing Day and New Year's Day, participants parade or ‘rush' on Nassau's famous Bay Street. Shrieking whistles, shaking cowbells and beating drums echo throughout the night. When the ‘rushes' end, at about 8 a.m., prizes are awarded to the groups with best costumes, music and theme portrayals. Spectators have it much easier. They sit on aluminum bleachers that line much of Bay Street. Of course, the best views are from the balconies overlooking Nassau's main business district. 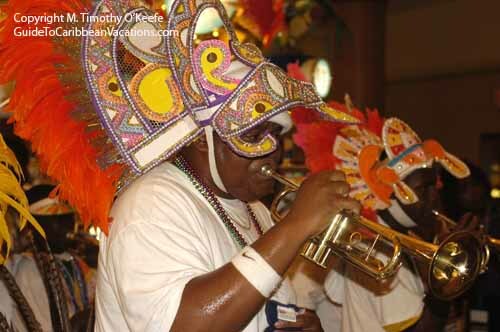 Bugles and horns like the one above were late additions to Junkanoo's array of instruments.